Four short years ago there was still a bitter debate over whether migratory birds were A) capable of spreading HPAI viruses over long distances and B) whether migratory birds could bring Eurasian avian flu viruses to North America by crossing the Bering straits. While it was known that some waterfowl species could carry HPAI viruses asymptomatically, the rallying cry that `Sick birds don’t fly’ was often used to argue that migratory birds couldn't be to blame for the international spread of the virus (see India: The H5N1 & Migratory Birds Debate). "There is currently no evidence that wild birds are the source of this virus and they should be considered victims not vectors." A year later they would modify their stance somewhat, by saying that typically the `. . . spread of HPAI virus is via contaminated poultry, poultry products and inanimate objects although wild birds may also play a role'. The great leap of HPAI H5N8 from Asia to North America in late 2014, and its spread to Europe, the Middle East, and Africa in 2016-17, have pretty much cemented the role of migratory birds in spreading HPAI viruses across long distances (see Migratory Birds & The Spread Of Highly Pathogenic Avian Flu). In fairness, recent genetic changes in clade 2.3.4.4. HPAI H5 viruses appear to make them more suitable for carriage by wild and migratory birds, although earlier HPAI H5N1 clades managed to mount impressive global geographical gains as far back as 2005-2006. Less settled continues to be how likely it is that Eurasian avian viruses can cross the Bering Straits and establish themselves in North American birds, although the arrival of HPAI H5N8 to the Pacific Northwest in late 2014 and the resultant record-setting epizootic showed that it was possible. 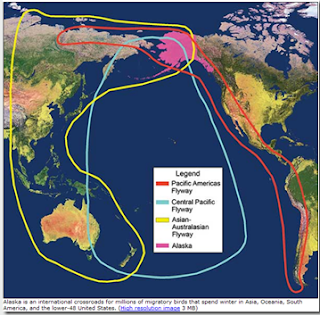 As the map at the top of this blogs shows, the Pacific Americas Flyway meets up with both the Central Pacific and (more importantly) the Asian-Australian Flyways over Alaska and Siberia. With Asia a hotbed of avian flu reassortment - spawning H5N1, H5N2, H5N6, H5N8, H7N9, H9N2, H10N8, and others in recent years - the possibility that these viruses might hitch a ride on a migratory birds and turn up in North America is of considerable concern. All of which brings us to a new EID Journal Research Letter, that announces the detection of another Eurasian (LPAI H8N4) virus - the 4th such detection in 7 years - among migratory birds in Alaska, and suggests that international spread may not be as rare as previously thought. I've only excerpted a few selections from a much longer report, so follow the link to read it its entirety. During 2010–2016, research and surveillance for influenza A viruses in wild birds inhabiting North America have provided evidence for the intercontinental dispersal of the following 4 viral genome constellations between Eurasia and North America: H16N3 (9), H9N2 (3), highly pathogenic clade 2.3.4.4 H5N8 (10), and H8N4 (this study). Four reports of independent purported intercontinental dispersal events for influenza A viruses via migratory birds during 7 years of sampling do not disprove the paradigm of restricted viral dispersal between Eurasia and North America. However, repeated detections of these viruses crossing the Bering Strait (3,10; this study) suggest that viral dispersal between East Asia and North America might not be exceedingly rare. Thus, a lack of selective advantage for comparatively rare foreign-origin influenza A viruses, purifying selection for endemic viruses, or both might be important mechanisms regulating the establishment of these viruses within the wild bird reservoir. Therefore, additional research directed toward understanding selection pressures regulating the establishment of these viruses might provide useful inference for informing surveillance and response activities for economically costly or potentially pandemic foreign-origin viruses in wild birds inhabiting North America. While there is nothing particularly ominous about an LPAI H8N4 virus, its genetic components - which can be shared via reassortment - can help drive increased diversity of local viruses. The discovery of an almost exact copy of the Asian strain in Alaska is also further proof that migratory birds can bring in Eurasian avian flu viruses. 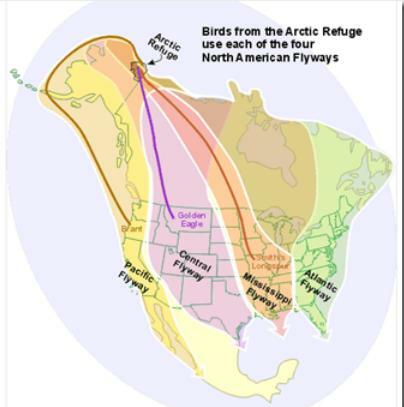 All of this matters because our own Arctic Refuge, where more than 200 bird species spend their summers, serves as a central hub, and funnels migratory birds south each fall via all four North American Flyways. With migratory birds soon to head south from their summer roosting areas, the risk of seeing new reassortants (LPAI or HPAI) emerge along these migratory routes will increase. Between 2016 and 2017 we saw three novel reassortants, all of which are now on the CDC's IRAT list. Although HPAI reassortant viruses have historically posed a much bigger threat to Asia and Europe, the experience of 2014-15 shows that North America is not immune, and so poultry interests along the flyways will want to ramp up their biosecurity as fall approaches.